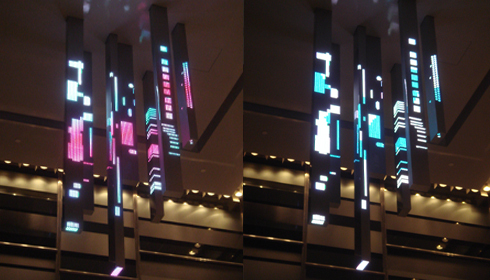 “Stella” is an organic video display with 7 strips suspended from the lobby ceiling. The art work represents the 7 key corporate missions of this Taiwan-listed computer giant. The ceiling glossy fabric and surrounding mirrors create interesting reflections of the LEDs.